Welcome to Australia’s Ultimate Buffalo Grass Comparison. For the very first time, Australian mums and dads have an easy to understand guide on buying the best Buffalo grass for their yard. All information is based on independent Buffalo grass research which was sponsored by all Buffalo grass license holders in Australia. In creating the Ultimate Buffalo Grass Comparison, we wanted to generate a resource for Australians which was easy to read and follow and understand at a glance. This Ultimate Buffalo Grass Review contains a summary of the most important quality aspects of the grass which should be considered before buying a new Buffalo grass lawn. Thatching levels are one of the most important considerations when choosing or growing a Buffalo lawn. Buffalo is known for its thick thatch layer which continuously builds-up over the years, and grows thicker and faster, when grown in full sun conditions. Therefore, a Buffalo variety that grows the least amount of thatch is of very high importance. Palmetto® is the Buffalo which grows the least amount of thatch in partial shade conditions, and most importantly, in full sun conditions too. Turf types have been tested extensively, thanks to independent research in Queensland, and thatch has been found to be a large consideration for those thinking of purchasing Buffalo grass. This testing found that Palmetto® and Sapphire® fitted into the Buffalo grasses that were “low thatch types”. While Buffalo can indeed be grown in full sun and partial shade conditions, it has historically always been considered a shade grass. This is because Buffalo grass has high shade tolerance, and develops more thatch at a more rapid rate when grown in full sun. All Buffalo grasses have high shade tolerance by their nature. However, if you are expecting higher than average shade levels on your property, then it would be wise to plant a Buffalo lawn with the greatest shade tolerance possible. Always remember, even Buffalo will need some sunlight each day, and will not grow in health past 70% shade levels, as no other grass can either. To date, Sapphire® has been found to be Australia’s most shade tolerant Buffalo grass. Palmetto® is more of an all-round performer but does have some shade tolerance. Buffalo is prone to heavy thatching at a greater speed when grown in full sun. Therefore we believe the number one trait people should look for when growing Buffalo grass in full sun, is to have the variety which thatches the least. Second to this most important aspect, would be factors such as low maintenance levels, less mowing and drought tolerant. In the same independent research in Queensland, Palmetto® was the Buffalo variety that thatched the least when grown in full sun. It also required the least mowing and maintenance out of all the other buffalo grasses when grown in full sun. Sapphire® was also a Buffalo grass variety that had strong qualities in this areas. Drought recovery is extremely important for all home lawns in Australia today. While one lawn may stay green longer when drought conditions arrive, this has no bearing on whether the lawn will recover after water restrictions or the drought has ended. Palmetto® Buffalo Grass is the winner by a massive margin over all competitors in terms of having the fullest and fastest recovery after drought or water restrictions have ended. Sapphire®, however, does rank in the top five Buffalo Grasses for drought recovery. Wear and tear tolerance means the ability for a turf to withstand and recover effectively from constant traffic and heavy wear. Wear and tear is of secondary importance in terms of quality as the majority of homeowners who want a heavy wear and tear lawn, in full sun, will probably opt not to choose Buffalo. Also most lawn areas in the shade are not generally subject to heavy wear and tear, because they are generally close to trees or have a garden or path installed instead of turf. However, those wanting a heavy wear and tear tolerant lawn would again be best to select Palmetto® Buffalo grass. It is truly a solid all-round performer. 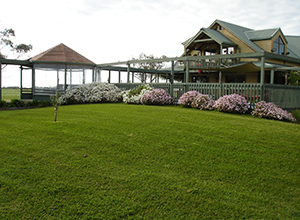 Winter colour refers to the ability for each Buffalo grass type to retain its green colour over winter. For example, the least amount of browning-off or loss of green when the weather turns cold. However for most lawn buyers, as long as the important aspects of turf quality are met, then winter colour is secondary. Again is the winner and maintains the best winter colour of all the Buffalo grasses tested when grown in full sun. Buffalo grass seeding can be a real nuisance for many people growing this as a home lawn. The stalks from buffalo seeding are thick and sometimes uncomfortable to walk across in bare feet. However, seeding is very normal in all grass types, and will diminish after a few weeks. Different Buffalo grasses can seed at different levels and at different times of the year. Therefore, the best and most reliable way to assess the lowest and highest seeding levels in Buffalo grass is to take year round seeding levels. Again, Palmetto® won with the lowest seeding and was almost a tie with Sapphire®. While Prestige® was not part of the above testing it is recommended to have a high tolerance for both shade and wear.